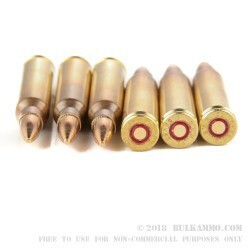 This ammunition is loaded to the same specs as M193 ball used by the US military. 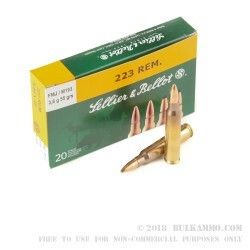 Made by renowned Czech manufacturer Sellier & Bellot, these cartridges use a standard 55 grain bullet and achieve a muzzle velocity of around 3,300 feet per second. 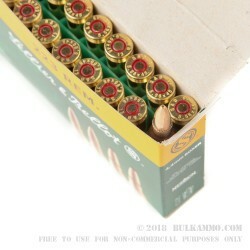 Each round in this box of 20 uses Boxer-primed reloadable brass casings. Sellier & Bellot is one of the oldest continuously operating ammunition manufacturers in the world. Founded in Prague in 1825 to fulfill military contracts for the Austrian Empire, the company is currently headquartered in Vlasim in the present-day Czech Republic. 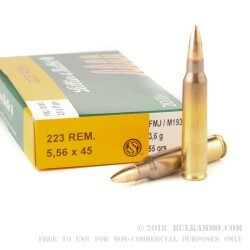 S&B ammo products are known for delivering high quality at moderate prices. Thanks to strong demand, the company exports over two thirds of its production to dozens of countries around the globe.